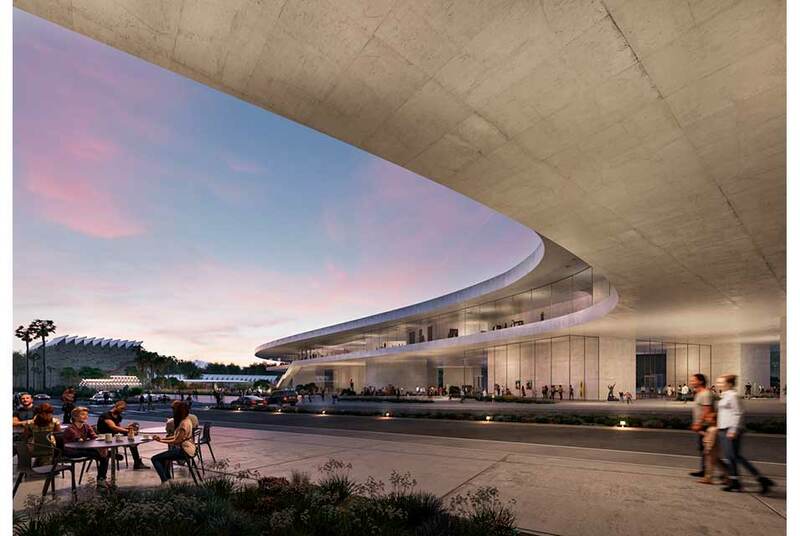 LOS ANGELES, CA.- The Los Angeles County Museum of Art announced this week that the County of Los Angeles Board of Supervisors has certified the Final Environmental Impact Report (FEIR) for the museums new building for the permanent collection and approved the project. The Board of Supervisors also authorized the issuance of the $117.5 million balance on its $125 million contribution for the project. The new building, The David Geffen Galleries, is part of a long-term plan to expand and improve LACMAs galleries and public space. As the final component of a decade-long transformation of the campus that nearly doubled exhibition space, programs, and more than doubled attendance, the new building, which has approximately 110,000 square feet of galleries, will replace four aging buildings (Ahmanson, Art of the Americas, Hammer, and Bing). Composed of seven semi-transparent pavilions that support a single elevated, organically shaped exhibition level with a floor-to-ceiling glass perimeter, the new building extends over Wilshire Boulevard to the existing parking lot on the southeast corner of Wilshire and Spaulding Avenue. By the time this Peter Zumthor-designed building opens and joins the Bruce Goff-designed Pavilion for Japanese Art and Renzo Piano-designed BCAM and Resnick Pavilion, LACMA will have grown over 15 years its indoor exhibition space from 130,000 to 220,000 square feet and added 3.5 acres of park and open outdoor space to offer visitors new and innovative ways to experience LACMAs vast encyclopedic collection. The horizontal design of the David Geffen Galleries will place art from all areas of LACMAs encyclopedic collection on the same level, with no obvious facade or front or back, offering a non-hierarchical display of arta fresh, Los Angeles perspective on the experience of a big art museum. The single-level gallery floor will be more intuitive to navigate and easier to access, especially for wheelchairs and strollers, and its perimeter of transparent glass will provide energizing natural light and views to the park and urban environment, with views from outside into the galleries. Most importantly, the display of all art on one level avoids giving more prominence to any specific culture, tradition, or era, offering visitors a multitude of perspectives on art and art history in a more accessible, inclusive way. The building also includes a new theater, education spaces, three restaurant/cafes, a museum shop, and covered multipurpose event spaces. The new facility includes much-needed and improved ancillary and back-of-house facilities that support LACMAs public programs, including two loading docks and enhanced security, facilities operations, visitor services, transit art handling, and more. The design removes space that doesnt need to be in Hancock Park, with staff joining existing museum offices across the street at 5900 Wilshire and storage moving offsite. The Countys environmental review process began in 2016 and included all environmental studies required by the California Environmental Quality Act, including historical resources, archaeological and paleontological resources, geotechnical issues, methane, security risk, traffic, parking, and water and wastewater infrastructure, among others. After meetings with neighborhood stakeholders and opportunities for public participation, a comprehensive Draft Environmental Impact Report was released on October 26, 2017. The County addressed public comments about the project during the 50-day public review period. The FEIR, which was released on March 22, 2019, found no permanent environmental impacts will be created by the new building. LACMA will work to mitigate and minimize temporary construction impacts in accordance with the FEIR. The total amount committed to date to the new building project is approximately $560 million, which includes a lead gift from philanthropist and entertainment executive David Geffen, Los Angeles Countys contribution, a gift from LACMA Board Co-Chair Elaine Wynn, as well as a significant pledge from the late A. Jerrold Perenchio. An unprecedented public-private partnership that will result in a more than 4:1 match for the Countys $125 million contribution, these commitments demonstrate an immense confidence and civic pride in LACMAs vision of what an encyclopedic museum can and should be to best serve the public in the 21st century. Included in the total are pledges and gifts by LACMAs board of trustees, which recently met its goal of collectively raising $250 million toward the campaign. Leaders of the board campaign include Elaine Wynn; Susan and Eric Smidt; Jami Gertz and Tony Ressler; Bobby Kotick; Steve Tisch; Laura and Casey Wasserman; Suzanne and Maggie Blount Kayne; Willow Bay and Robert Iger; and Debbie and Mark Attanasio. This outpouring of generosity far surpasses any precedent for campaign fundraising at a cultural institution in Los Angeles, with additional major contributions from Joshua S. and Beth C. Friedman; Allison and Larry Berg; Alexandra and Steven Cohen; Geoff Palmer; Margie Perenchio; Jeanne and Anthony Pritzker; Jane and Terry Semel; Sheryl and Jonathan Sokoloff; Florence and Harry Sloan; Ryan Seacrest; David Bohnett; Carole Bayer Sager and Bob Daly; Drs. Rebecka and Arie Belldegrun; Viveca Paulin-Ferrell and Will Ferrell; Ann Colgin and Joe Wender; Wallis Annenberg; Ambassador Nicole Avant and Ted Sarandos; Ambassador Colleen Bell and Bradley Bell; Suzanne Deal Booth; Rebecca and Troy Carter; Eva Chow; Helgard Field-Lion; Andy and Carlo BrandonGordon; Victoria Jackson and William Guthy; Mary and Daniel James; Jay Levitt and Carisa Janes; Jamie McCourt; Carter Reum; Ann Ziff; and numerous others.